The third microphone in JZ’s “Vintage” series, the V12 is designed to recreate the sound of the AKG C12. Like the other microphones in this series, the V12 uses a transformerless solid-state circuit as the basis for a capsule that has been designed to sound like a tube- and transformer-based microphone. The V47 and V67 share this circuit, which has lower impedance (50Ω) and significantly lower noise (6dBA) than the tube microphones whose sonic characteristics the Vintage-series microphones otherwise reproduce. The GDC12 capsule, unlike the AKG CK-12, is a center-terminated design. Like the other Vintage-series capsules, it uses JZ’s proprietary “Golden Drop” sputtering technique, which is said to produce faster transient response and more accurate sound due to the lower mass of the gold on the diaphragm. 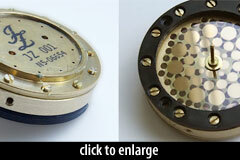 The capsule is a single-diaphragm design. The swivel mount built into the bottom of the microphone body facilitates positioning. Because the capsule is shockmounted within the headbasket, no external shockmount is provided. The JZ Microphones Vintage V12 is also known as: V12.